Experience an Alchemical Transformation in a Day of Play, Exploration, and Discovery of Your Multifaceted Self. During this day you will have the opportunity to explore, discover and try on maybe one or two new personas of yourself as the Goddess of Love. 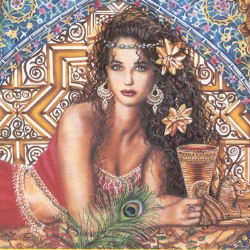 You might meet yourself as the Primal Goddesses or the Goddess of Sensuality and Beauty or as the Sacred Courtesan. All three of these aspects live inside you waiting to be revealed. Acquire a new sense of sexual savvy, confidence and allure. Feel more connected to all aspects of the Goddess of Love in you. Find out what it means to walk with Sexual Presence and step into it with integrity and power. Have the ability to shift from one persona to another. Questions, call Luminessa at 415-717-9378.
Who Can Take This? Anyone who is female identified or feels that these aspects of the feminine are something you wish to explore. For any questions please contact me at 415-717-9378 or message me. https://www.facebook.com/Newfemininemystique/ and is a teacher of women's sexuality & spirituality,, sacred theater, Tantra, channeling, sexual healing, temple dance, and the mythology of the Goddess.